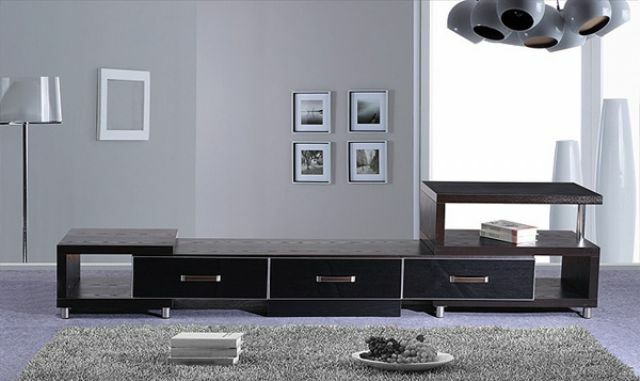 Hanaco’s TV stand features clean-lines, Euro aesthetics and smartly arranged compartments. TV stands have become indispensable furnishing in homes since the appliance, generally accepted as offering the cheapest form of entertainment, has become the source of conversation and, since the invention of flat-screens, even status symbols for upscale home owners. Despite serving basically the same function, TV stands are sometimes designed to multitask as including bookstand, curio cabinet, so can take on shapes, sizes and styles with wide ranging variations, from classical to modern and minimalism. Developing its TV stands along such lines is Hanaco Group, founded in 2006 and today a world-caliber manufacturer and marketer of furniture, with a production base in China and a branch in Taiwan. Hanaco's TV stand series encompasses a variety of models with compact, Euro-style exterior and bright finish for premium image, which help to add charm to living rooms, and more importantly help retailers and wholesalers create profitable business. Furthermore, size and structural design can be customized to meet different market requirements and user needs in terms of enhanced storage capacity and practicality. The TV stand series is also characterized by excellent durability, achieved by Hanaco's insistence to use only top-grade material coupled with ample structural engineering and production expertise. With contemporary exterior coupled with exquisite trim, as well as great practicality, the firm's TV stands have proven sought-after worldwide. Despite its relatively young age of only 9 years, Hanaco claims to be one of the few furniture makers that have integrated production and sales capabilities, from material handling to furniture manufacturing, backed with rich cross-strait sales experience. It is fully able, the company says, to serve clients with ample capacity, high production efficiency, consistent quality, and timely after-sale services. The group has a capitalization of US$10 million and employs more than 800 workers at its China manufacturing base, which occupies some 90,000 square meters and has enough capacity to turn out furniture to fill 200 40-foot containers a month. Around 80 percent of the firm's products are exported to Japan, with the remainder going to Europe and the U.S.
Hanaco takes particular pride in its highly integrated production, with complete lines of equipment for melamine processing, PVC and PU lamination, vacuum forming, sheet metalworking, powder coating, plastic injection molding, fastener and hardware manufacturing, and packaging, which has enabled the company to establish a solid reputation in the industry. Strong commitment to quality is another element in Hanaco's success. The company carries out strict quality control throughout the production process, and its manufacturing base has won ISO 9001 and ISO 14001 certification to assure customers the best quality and added-value. The manufacturer also pays strict attention to R&D, also being fully able to develop new products in cooperation with customers. The firm's product lineup covers living room furniture, office furniture, desks, storage cabinets, bathroom furniture, dining room furniture, racks, shelves, specially crafted home decorations, and other quality products.